“I’ve been informed that the governor has decided to interject himself in this process, and doesn’t want this approved in this form,” Cullerton said. After the Illinois Senate failed to take action Wednesday on items from its elusive bipartisan budget deal, Senate President John Cullerton blamed Gov. Bruce Rauner for inserting himself in the ongoing negotiations. Cullerton noted that senators are now in a “holding pattern” as bills are amended to forge a compromise with Rauner and the Republicans. The Senate was expected to vote Wednesday on a list of bills from the “grand bargain,” including education funding, workers’ compensation reform, pension reform, and a proposed property tax freeze, among others. The governor’s office credited senators' bipartisan efforts to pass a budget to end the state's nearly two-year impasse, but wouldn’t offer details about what Rauner opposes. The Senate approved portions of its sweeping budget deal Tuesday, passing a spending bill that would fund the state's beleaguered social service agencies and public colleges and universities through June. 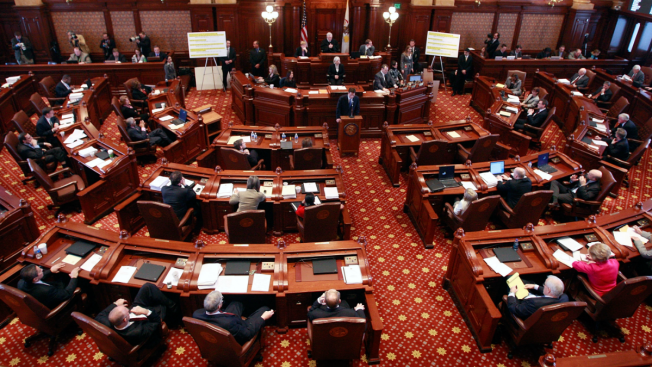 In addition, senators approved bills from the package to fund Chicago teacher pensions and expand gaming revenues by authorizing six new casinos throughout the state. However, Cullerton’s pension reform bill failed Tuesday for the second time. He placed the measure on postponed consideration so it can be voted on later, which is important because all the bills in the package need to pass for any to become law. During her final remarks Wednesday, Senate Republican Leader Christine Radogno seemed frustrated that no further action was taken. “Our state is suffering so badly right now and I know how many of us in this chamber, I think almost without exception, want us to get the budget together so that we can move forward,” Radogno said. She pushed senators to approve the deal “sooner rather than later,” noting that Rauner would be joining in negotiations.